Department of Saidla (Unani Pharmacy), Faculty of Unani Medicine, Aligarh Muslim University, Aligarh, INDIA. Sumbul-al–Teeb (Nardostachys jatamansi) is a well known traditional medicinal plant used for therapeutic effect in Unani and Ayurvedic System of Medicine. It has been reported to have many therapeutic activities like antifungal, antimicrobial, antioxidant, hepatoprotective and cardioprotective properties. It is also useful in the management of insomnia and CNS disorders. The present study aims towards the evaluation of the parameters involved in the determination of the quality and purity of Nardostachys jatamansi rhizome and its standardization. Organoleptic characters, extractive values, ash values, phyto-chemical analysis, TLC, fluorescence analysis and HPLC profile etc. were the parameters used for the standardisation of the test drug. Total ash values, water and alcohol soluble extractive values, moisture contents and volatile oil percentage was found to be 7.08%, 3.54%, 2.5%, 8.6% and 02% respectively. TLC profile of N. jatamansi shows 04, 08 and 10 spots in UV short and long wavelength and exposure to iodine vapours respectively. The HPLC pattern shows 34 peaks and the peak no. 01 and 08 are major peaks having area concentration and retention time as 25.974% at 2.8 min. and 29.967% at 4.399 min. respectively. The study will provide referential information for the good quality, purity and identification for the future batches of Nardostachys jatamansi. Nowadays the Indian herbal industry is flourishing at an admirable pace with remarkable increase in the introduction of new herbal pharmaceutical and cosmetic products in the market. But due to ignorance and awful supply chain management of herbal medicines, quality and purity of herbs and their products is not assured. As the efficacy and safety of herbal products is strongly based on their good quality therefore, determination of identity, quality and purity of the herbal medicines is unavoidable. The traditional approach towards standardization for obtaining good quality herbal medicines seems to be insufficient for the current herbal market which invites the need for more advanced techniques. Standardization of the crude drugs involves passport data of the drugs viz., botanical identification, and macroscopic, microscopic and molecular examination, identification of Phytochemical constituent by various chromatographic techniques and biological activity of the whole plant.1 Due to the high commerce, traders have imperilled plants and their products to adulteration and substitution. 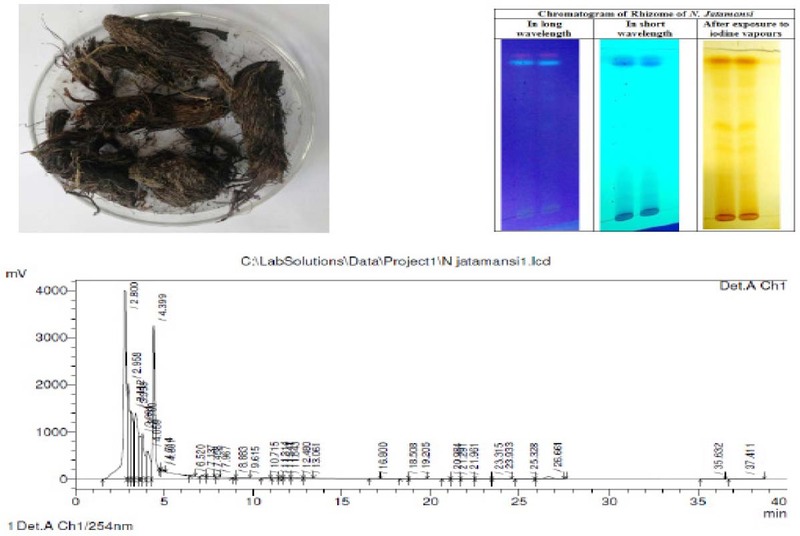 The present study was carried out in order to standardise the rhizome of Nardostachys jatamansi with a view to develop its quality parameters, and also to deliver referential information for the identification of the crude drug so as to check the substitution and adulteration and to ensure the effectiveness of a drug in treating different body ailments.12 Parameters include macroscopy, powder analysis, physicochemical parameters and preliminary phyto-chemical screening alongwith HPLC profile. Dried rhizome of N. jatamansi was procured from local market of Aligarh and was properly recognized from the accessible literature and authenticated by Prof. S. H. Afaq. The sample with specimen voucher no. SAMU/NJ-R-0001/17 was deposited in the Department of Saidla, Faculty of Unani medicine, Aligarh Muslim University, Aligarh, for future reference. It was crushed and sieved to coarse powder mechanically and stored in air tight container for study. The organoleptic characters of the crude drug were observed with sensory organs and was analysed for its colour, odour and taste, size, shape, fracture and surface. HPLC profile of the methanolic extract of the N Jatamansi was done. For this Shimadzu Prominence Isocratic HPLC System equipped with LC-20 AD Solvent delivery unit, Rheodyne Injector, SPD-20A prominence Uv-vis detector system along with C18G120A column, 250x4.6 mm 5U with guard column was used. The methanolic extract of coarsely powdered drug was obtained with the help of soxhlet’s extraction method, extract was filtered and allowed to evaporate on water bath. This dried alcoholic extract was dissolved in HPLC grade methanol and used for study. The chromatographic analyses were carried out at room temperature using reversed phase and software driven peaks were obtained (Figure 2). The pressure and flow rate was 127 kgf and 1.0 ml/min, respectively. Detector for HPLC was UV and the wavelength was 254 nm. Mobile phase for HPLC profile of extract consisted of HPLC grade methanol (Merk life science Pvt. Ltd.) only. Modern system of medicine relies on sound experimental data, toxicity studies and human clinical studies. But there is a lack of pharmacopoeial standards on raw material / finished products. The insufficient quality standards have led to the occurrence of mild to serious adverse effects. Hence, the standardization of herbal ingredients is the basic requirement in order to establish the identity, purity and quality.20 Herbals are traditionally considered safe and are remarkably consumed by people without prescription. However, it is advocated that some can cause health problems, some are not effective and some may interact with other medicines. Standardization is crucial for the assessment of the quality, purity and authenticity of the drugs, based on the physicochemical parameters, TLC, HPLC and on the presence of active principles.21 A standardized and good quality drug is the assurance of its therapeutic effectiveness and global acceptance. Nardostachys jatamansi is a well-known drug of Unani System of Medicine used to treat various body ailments such as inflammatory conditions. Therefore, for this study Nardostachys jatamansi was selected and standardized on their physicochemical parameters such as organoleptic characters, ash values, extractive values, volatile oil estimation, fluorescence analysis, qualitative estimation, TLC along with HPLC profile. Organoleptic properties are the critical parameter for the rapid identification and consumer acceptance. Sensory evaluation-visual macroscopy, colour, odour, taste, fracture are the common features helped in identification of the crude drug. The organoleptic properties of rhizome of N. jatamansi have been mentioned in Table 1. Ash values, alcohol and water soluble extractive values, loss of weight in powdered drug after drying at 105°C and moisture contents are the indicators of the purity, quality and authenticity of any crude drug. Therefore, to standardise a herbal drug these parameters have basic importance and unavoidable. Total ash values, acid insoluble and water soluble ash values reveals the information related to the adulteration of crude drug with inorganic matter. The water and alcohol soluble extractive values indicate the amount of the extract that the drug yields in a solvent.16 Less or more extractive value indicates addition of exhausted material, adulteration or incorrect processing during drying, or storage of plant products.22 Low or high moisture contents may affect the quality of the drug and hence, its efficacy. The excessive moisture is an ideal medium for the growth of the different types of microorganisms which subsequently damages the drug.23 This drug is also well known for its oil contents. The inappropriate method of extraction of oil or distillation and storage may spoil the quality of the drug and hence the oil.23 Therefore, to assess the quality of N. jatamansi it is also necessary to determine volatile oil percentage of the drug. All the values were determined in triplet and the results are depicted in Table 2. Some constituents in many natural products exhibit fluorescence in the daylight ultra violet light and if the substance itself is not fluorescent, it may often be converted into fluorescent through the application of different reagents. Hence, the qualitative assessment of the test drug is carried out in this manner also which serves as an important parameter for pharmacognostic evaluation of crude drugs.24 (Table 3). The efficacy and pharmacological therapeutic effects of any herbal medicine is depends on their secondary metabolites i.e. phytoconstituents such as alkaloids and glycosides etc. The presence or absence of these phytoconstituents also indicates the quality of the crude drug.24 Therefore, it is also necessary to determine the presence of active secondary metabolites in the test drug, the results are shown in Table 4. TLC is one of the important parameter equips with the qualitative and semi-quantitative information of the drug. If the drug is adulterated or exhausted which in turn may increase or decreases the number of spots and change in the Rf values.16 The TLC profile alongwith images of TLC are illustrated in Table 5 and Figure 1 respectively. TLC Profile of N. jatamansi rhizome. The preparative and analytical HPLC has been widely employed for the analysis of herbal medicines in lieu of its high separation capacity. It can also be utilized to analyse almost all constituents of herbal products provided that an optimized procedure is developed which involves optimization of mobile phase and stationary phase along with other chromatographic parameters.25 The adulteration and impurities can also be determined by this technique. If there is any change in number of peaks or retention time or area of peaks from standard it indicates adulteration or deterioration in the drug. The HPLC pattern shows 34 peaks and the peak no. 01 and 08 are major peaks having area concentration and retention time as 25.974% at 2.8 min. and 29.967% at 4.399 min. respectively followed by peak no. 04, 02, 03, 06 and 07 with concentration of 11.258%, 8.908%, 8.722%, 6.455% and 4.331% respectively. The HPLC profile of the test drug was obtained and recorded for future reference. The details are depicted in Figure 2 and Table 6. HPLC profile of alcoholic extract of N. Jatamansi rhizome. 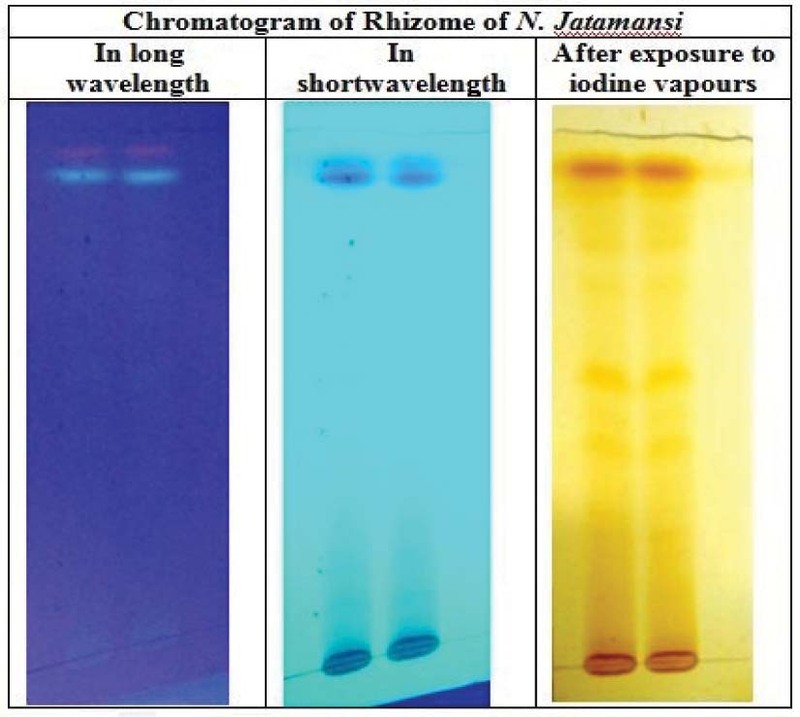 Present study shows that the methods of standardization and identification of N jatamansi i.e. organoleptic characters along with physico-chemical analysis are the basic and useful parameters to analyse the originality of the test drug. A good quality of drug is the assurance of its efficacy. The results of phytochemical analysis and HPLC fingerprinting also play a key role in identification and authentication of N jatamansi. Further these analytical parameters for quality assurance also indicating effectiveness of N jatamansi for treating various body ailments. The data obtained in the present work will be useful in identification, standardisation and quality assurance of different samples of N. jatamansi and will also be useful in the preparation of the drug’s monograph for inclusion in various pharmacopoeias. The present study aims towards the evaluation of the parameters involved in the determination of the quality and purity of Nardostachys jatamansi rhizome and its standardization. The parameters used for the standardisation of the test drug includes organoleptic characters, extractive values, ash values, phyto-chemical analysis, TLC, fluorescence analysis and HPLC profile etc. The study will provide referential information for the good quality, purity and identification for the future batches of Nardostachys jatamansi. 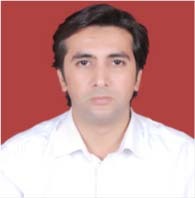 Dr. Aziz ur Rahman is working as Assistant Professor in Department of Saidla (Unani Pharmacy), Faculty of Unani Medicine, Aligarh Muslim University, Aligarh. His research area includes standardization, drug design & discovery, formulation development and experimental research.